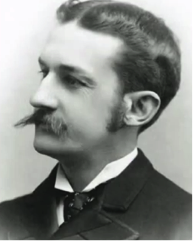 Charles Edward Carryl was an American poet and author of children’s books. Many critics have said that he wrote primarily for children but there is evidence that he wrote this material as much for his own amusement as for others. He certainly adopted a rollicking, easy to read poetic style that would have been a joy for young readers, perhaps starting out on their first journeys through the world of rhyming verse. By the end of the 19th century critics were calling him the “American Lewis Carroll” and a master of children’s fantasy stories. He was born on the 30th December 1841 in New York City. There is little recorded about his early years but it is known that his father was a successful businessman who encouraged his son to follow him in that line. Charles grew up with ambitions to succeed in business while also finding the time for literature which he saw as a pleasant diversion. He achieved second-generational success in business, particularly in the field of railroad companies. He was also an accomplished stockbroker and, from 1874 until 1908, he held a seat on the New York Stock Exchange. Carryl was married in 1869 to Mary Wetmore and their eldest child, Guy Wetmore Carryl, became a humorous poet himself. It is thought that he was inspired by the enthusiasm of his children for literature to write his own stories. He was a fairly late starter as an author, not publishing his first book until 1882 at the age of 39. Even then, this was a business related publication called Stock Exchange Primer which followed numerous articles and papers that he had already written on the subject of stock transfer business Two years later came his first dip into children’s fantasy tales with a novel with the intriguing title Davy and the Goblin; or, What Followed Reading “Alice’s Adventures in Wonderland”. It was an imagined story of what adventures might be had by a young boy who falls asleep reading Lewis Carroll’s famous story while sitting in front of a roaring fire. A goblin appears to him from the flames and takes the boy on fantastical adventures where he meets real and imaginary characters from other works of literature. 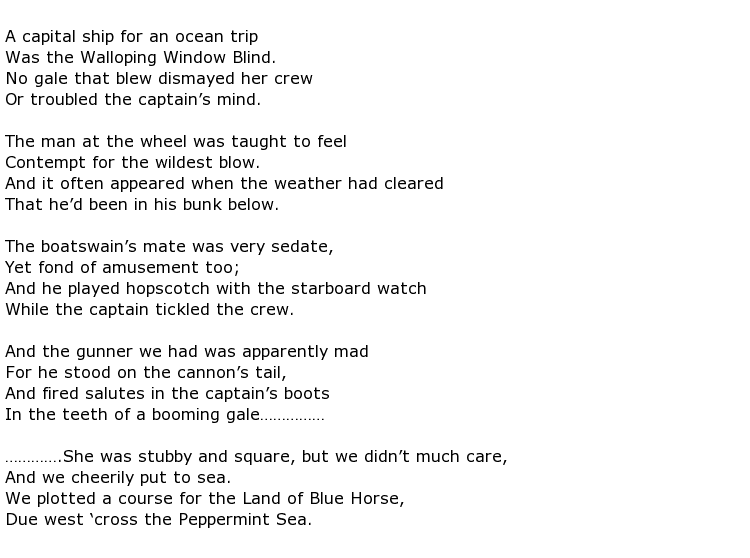 This poem has also been adapted into a song using the tune from the 19th century sea shanty called Ten Thousand Miles Away. By the time of his death Charles Edward Carryl had proved beyond doubt that the concept of the nonsensical fantasy story did not sit exclusively within the domain of British authors like Lewis Carroll. He died on the 3rd July 1920, aged 78.